Fujita Kanko Co., Ltd. is a "multifaceted hospitality company" whose corporate mission is to contribute to the realization of a prosperous and rich society by providing a healthy relaxing place and warm hospitality based on the keyword "tradition and innovation" . Besides business, resort, luxury hotels, we also operate wedding banquet facilities, golf course, aquarium etc. This time, we are seeking candidates who would like to work at our WHG Hotels", which are well-kown as accommodation-oriented hotels. "Washington Hotel" aims to become a hotel that responds to the needs of everyone by adopting IT technology, pursuing convenience and comfort. "Hotel Gracery " aims to become a hotel which can offer beautiful sightseeing and great leisure to its guests by offering tourist information at the hotel lobby. We are accelerating the opening of stores, not only in Japan but also overseas. Working places will be Washington Hotels, Hotel Gracery and Hotel Tavinos all over Japan. 【Hotel Front, Concierge】Being in charge of check-in, check-out, information desk, and responding requests of the guests during the stay. 【Accommodation reservation service】Respond reservation of accommodation by telephone and email from customers as well as reservations from travel agencies, accommodation reservation sites, and sales offices around the world. ・would like to challenge the business management position of the newly opened hotel. In our company, a contract employee is working without transfer (area limitation). You will be eligible to take the permanent employee position after one year working. If you pass the screening, you can become a full-time employee. 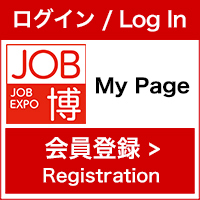 More information will be provided at our booth on the day of JOB HAKU. The hotel is a workplace where you can interact with customers from various countries and use your language skills to improve your interpersonal skills. With the opening of new hotels in Japan and Asia and an increase in the number of foreign tourists visiting Japan, we are strengthening our recruitment of foreign staff. Currently, international staffs are active at WHG hotels throughout the country. Don't you want to work with us?